OK, OK, most people can not afford to buy property in Singapore because the property price in Singapore is soaring. You may be shocked that even a HDB flat in Singapore can fetch a value well above market value. A lot of Singaporeans are worried, simply because you may have to spend S400k-S500k to buy a good location 5-room flat now. Anyway, I am not interested to talk about property bubble or economics today although a lot of people anticipate property market in Singapore will cool down in 1-2 years time. This project interests me because it is being developed by Wing Tai, Singapore. Yes, Helios Residences-The Ultimate Urban Living Experience!! 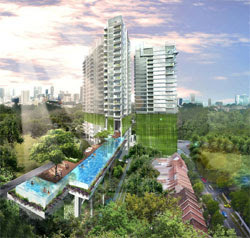 Helios Residences, boast a one-of-its-kind luxurious living comprising 140 freehold apartments. Cradled amongst lush vines in the development, complimenting the greenery in the prime and established Cairnhill enclave, you’ll find a sanctuary of bliss relaxing in the very 1st and unique Tree Top Recreation Deck that soars 4 levels above ground, hosting a series of amenities in the Entertainment Wing, Wellness Wing, Family Wing and Children’s Wing. And more……, you may stroll down towards the Garden Wing to explore the undulating ground of activities that keep your guests and family sure footedly occupied. Such a brilliant extension to your spaces at home! !